GCU’s recent growth as an institution was on display Friday for a record number of high school students from across Arizona at the annual Health Sciences and Nursing Day. 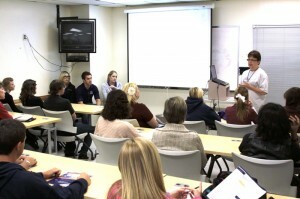 Students toured the simulation and cadaver labs and attended several breakout sessions. An estimated 2,500 students — an increase of 1,000 over 2010 — visited campus, attending a number of breakout sessions and touring points of interest such as the cadaver and simulation labs. About 60 high schools were represented, from as far as Prescott, Bisbee, Tucson and Nogales. Since its first graduating class in 1984, the University’s nursing college has grown to the point where it is admitting about 400 students annually and holding classes at five satellite locations in addition to the main campus. Roat, a pediatric nurse who has been on the faculty for 24 years, said a nationwide nursing shortage will approach 800,000 by 2020, creating a multitude of career opportunities for GCU graduates in the state and beyond. A light in your house and food on your table. “Not too many nurses don’t have a job,” Roat said, adding that starting salaries can be $45,000 and higher.